The Wolf Wilder is the story of Feo – short for Feodora – who lives in the snowy woods of Tsarist Russia with her mother. Both of them are wolf wilders – people who take in wolves who have been adopted as pets by aristocrats then abandoned when it became clear that a wolf could never fully be tamed; they then undergo the process of re-wilding the wolves so the wolves can live free in the forests. Feo and her mother don’t have much to do with the world of people – they’re far more comfortable living, eating, sleeping, and playing with the wolves. But the world of people intrudes into their lives when General Rakov, the sadistic leader of the Tsar’s forces in the area, decides that all wolves are pests and are to be killed on sight. When Feo and her mother defy the soldiers, Feo is forced to go on the run with only a soldier boy called Ilya and her wolves for company. Feo is a great character – feisty and determined like all the best heroines. She’s part wild herself, and more than a bit wolf. Ilya is a boy soldier with the soul of a ballet dancer, and he provides an excellent contrast to Feo’s wild nature and a faithful companion. When Alexei, the budding revolutionary, turns up he adds to the dynamic of their group – his ideals are fierce and honest, but his aims are his own, and he helps Feo only insofar as it furthers his ambitions. The setting is richly evocative – you can almost feel the cold coming off the page – and the plot races along as Feo gets caught up in intrigue and revolution. There’s heartbreak and horror along the way, too, and you’re desperate for Feo to save her mother and her pack from the implacable forces arrayed against her, and you dread the inevitable showdown with General Rakov. Gelrev Ongbico produces an amazing cover that’s surpassed only by the quality of the interior illustrations. The black and white pictures are the perfect medium for the depiction of the wolves and the winter forest, and every scene is vibrant with icy beauty and fierceness. In fact the illustrations add so much atmosphere to the book that I can’t imagine reading it without them. It’s a volume that you really need to hold in your hand as a physical book. I’m no Luddite when it comes to ebooks – I’ve got literally hundreds of books on my Kindle – but there’s something really special about the love with which this book has been put together, right from the heavy paper to the gorgeous illustrations and lovely clear typesetting. Add some marbled endpapers and a sewn-in silk bookmark and I might have expired with happiness. 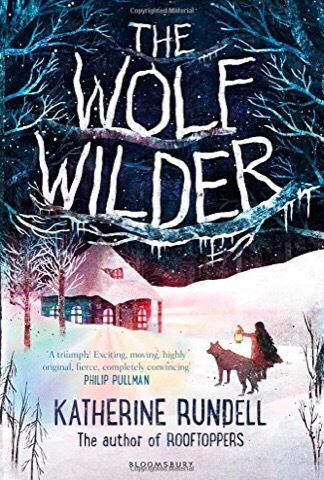 Katherine Rundell’s Rooftoppers was one of my top children’s books of 2014, but The Wolf Wilder is so much better that I dread to think how good her next book is going to be.